Turn off the lights. Turn up your Speakers. You're about to experience what no one has ever experienced - the totally immersive, surreal, and beautiful adventure of MYST in Realtime 3D. 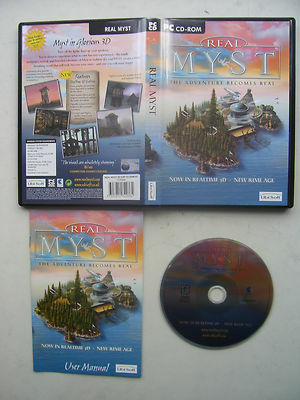 Real MYST creates a living breathing world that will truly become your own - and one you will never forget. Few are chosen. Fewer succeed. Journey now to an island world surrealistically tingled with mystery where every vibrant rock, scrap of paper, and sound may hold vital clues to you unravelling a chilling tale of intrigue and injustice that defies all bounderies of time and space.